So I’ve been waiting for this for a while. Finally, there is a decent demo of the Electro-Harmonix Germanium 4 Big Muff Pi. Not sure why it’s been hard to find a good demo, but a couple of days ago Gearmanndude came through with his 8+ minute demo, and he really shows what it’s capable of. The Electro Harmonix Germanium 4 Big Muff is split in two. One side is Overdrive and the other is Distortion and you can have them both on. 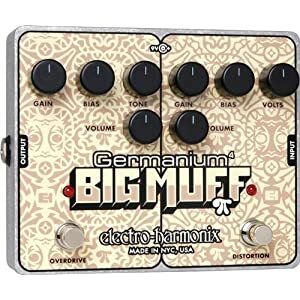 You can currently pick up the Electro-Harmonix Germanium 4 Big Muff Pi at Amazon for $99.75 and has FREE super saver shipping.